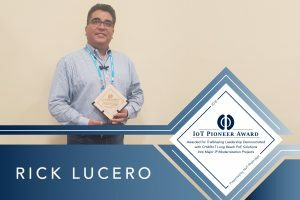 Congratulations Cisco‘s Rick Lucero! Rick used PoLRE® innovation to help New Mexico State University facilitate a simple, secure and cost-effective deployment of 7,000 Cisco IP phones across their 900-acre campus. Thanks to Rick’s leadership and commitment to innovation, New Mexico State University was able to reduce project costs by $1 million, accelerate deployment time by 3 years, and prevent 21 tons of e-waste. 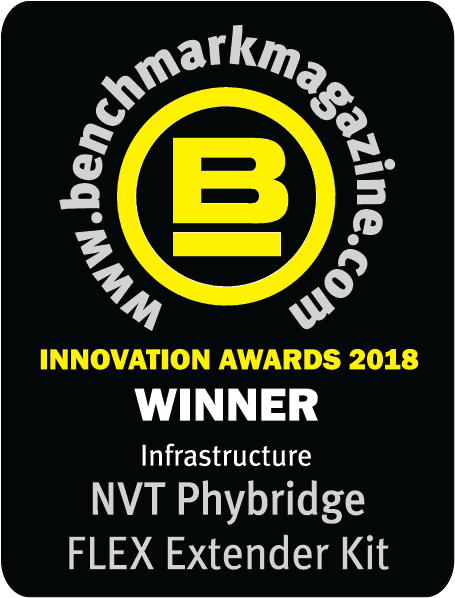 Ontario, Canada (August 9, 2018) – NVT Phybridge FLEX Extender Kits have been named as the winner of the 2018 Benchmark Innovation Award in infrastructure. The FLEX Extender Kits build on the success of the award-winning FLEX family of products, designed to extend PoE over new or existing infrastructures up to 2,000ft (610m) – 6Xs farther than standard Ethernet switches. The kits, along with the entire FLEX family of products, have already helped hundreds of organizations all over the world facilitate a simple, secure and cost-effective modernization to IP. NVT Phybridge is the leader in Power over Long Reach Ethernet (PoLRE) using Modern LAN principles and technology to make IP connections efficient and cost-effective. The CHARIoT Series of switches help customers modernize to an IP-based network, transforming their new or existing infrastructure into an IP path with power. NVT Phybridge is a North American-based technology company with global reach dedicated to practical innovation, producing innovative and affordable solutions for over 24 years, with technology that is currently supporting millions of IoT endpoints. New Mexico State University (NMSU) has been serving the educational needs of their multi-cultural population since 1888. The land-grant university excels in teaching, research and public service, preparing students for careers in agriculture, the sciences, business, education, engineering, the arts, and social services. As part of their commitment to excellence in education, the university decided to modernize their communications platform. NMSU’s existing analog communication system was approaching end-of-life. The university wanted a refresh and was looking to take advantage of IP phones and applications to increase efficiency. However, operating in around 100 buildings spread across a 900-acre campus significantly complicated the project. High cost, business disruption, and length of deployment time were major concerns, as the university first needed to upgrade their infrastructure to support the communications system. IoTG (Internet of Things to the Power of Green) measures and recognizes environmentally responsible IoT projects. New Mexico State University was awarded the highest rating, 5 stars, for their environmentally responsible modernization to IP telephony. As companies modernize to the Internet of Things, each additional IP endpoint connected to the network represents a potential access point for malicious activity. In DartTrace’s 2017 Global Threat Report, it was determined that hackers gained unauthorized access to critical company data through various IoT endpoints, including thermometers, smart artboards, and server closets. Modern LAN principles provide a fundamentally new approach to network design. For New Mexico State University, leveraging the existing and reliable point-to-point network topology created a physically separate but functionally integrated network path for the new IP phones, ensuring the security of the core business network. “[The solution] allowed us to leverage the centralized location and backup capabilities and create a robust IP backbone for our new IP phones,” says Ray Cadena, NMSU’s Manager of Telecommunication Systems. By leveraging PoLRE innovation and applying Modern LAN principles, NMSU was able to significantly accelerate their return on investment. The University decreased deployment time by over 3 years and saved over $1 million in infrastructure costs, reallocating more budget to ROI driving applications. A large transportation system is modernizing their security system as they continue their mission of providing safe and reliable transit. Public transportation is the foundation for building strong, connected communities, and everyone should feel safe traveling to work, school, or their weekend event. The organization was relying on an outdated analog CCTV security system and decided to modernize to an IP-based solution across their major bus terminals and parking lots. To ensure the safety of the 340,000 daily riders, the organization is upgrading 110 analog devices to new high-resolution IP cameras. The new security system will deter criminal activity, as well as increase surveillance and recording capabilities. A project of this magnitude would usually take years to complete, as the traditional upgrade method involves ripping/replacing/rebuilding the network infrastructure to support IP devices. This process is extremely costly and would create significant disruption to riders. However, by applying Modern LAN design principles, the organization designed an upgrade plan that would eliminate these concerns. Using CLEER24 switch technology, the organization will leverage their existing Coax-based infrastructure to transmit data and power to their new IP cameras. The solution will eliminate the need to rip-and-replace miles of cabling, reducing deployment time by 90% and saving over $15,000 of taxpayer funds. The switch’s long reach capabilities will allow the customer to connect cameras up to 4,000ft. (1,220m) away, providing complete surveillance coverage in the vast open spaces of the bus terminals and parking lots. The transportation system is committed to environmental responsibility and continuous improvement. The SmartDriver program provides training to all operators, which is proven to reduce emissions and fuel consumption. The training also teaches operators how to reduce wear and tear on vehicle components, extending their life span and reducing material consumption. When the decision was made to modernize the security system, the organization was concerned about the project’s environmental impact. Aligned with the organizations sustainability programs, the security modernization will prevent 6,600 pounds of Coax cable from ending up in a landfill. The transportation system has also eliminated the need to upgrade the existing server closets, further reducing the project’s e-waste and ongoing energy consumption. Satisfied with the solution, the transportation system plans to use FLEX switch technology to implement a new IP intercom system. The transportation system took a pro-active approach to find new and better ways to support their IP modernization objectives in a financially and socially responsible manner. By applying Modern LAN principles and leveraging innovative switch technology, the organization will save taxpayer money, eliminate risk and disruption, reduce the negative impact on the environment, fast track their IP modernization and build a secure and robust platform for their new IP security solution. Oakville, ON (July 12, 2018) – NVT Phybridge, the global leader in long reach Power over Ethernet technology, is excited to announce the opening of a new office and demo lab in India. Director Arvind Vimal David, along with his experienced team, will help customers in India efficiently modernize to the Internet of Things. For over 24 years, NVT Phybridge has been helping organizations all over the world modernize to IP. 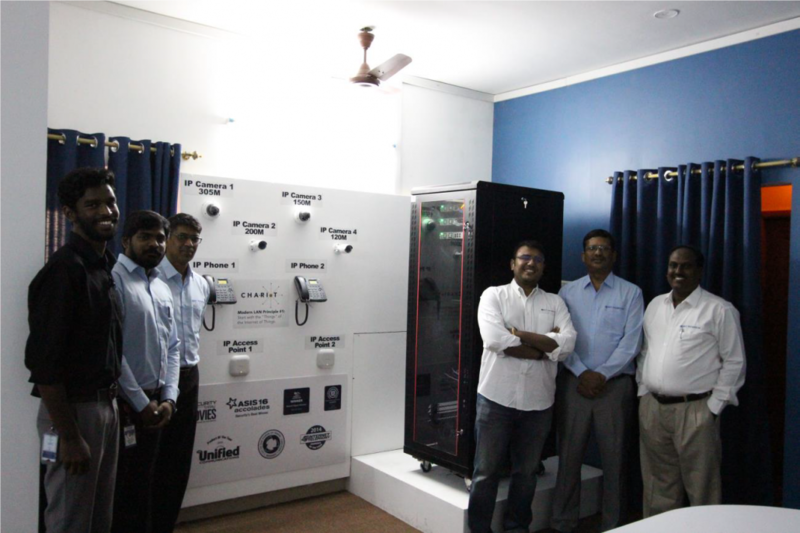 The new India demo lab showcases the unique value proposition of the company’s long reach switch technology that extends PoE to more than 610 meters, and its ability to transmit IP signal and power over Coax, single-pair and multi-pair UTP. “The demo lab will help prospective customers understand the practical deployment of their solutions, as well as provide a laboratory for the technical team to attend to customer calls”, explains Arvind Vimal David. NVT Phybridge has enabled customers across the globe to collectively save more than $100,000,000 by eliminating risk and fast-tracking their modernization to IP, maximizing the return on investment using the existing cable Infrastructure. NVT Phybridge has also partnered with Inflow Technologies. As an established player in the IT distribution market serving India and South Asia, the strategic partnership will help NVT Phybridge connect with system integrators, resellers and customers looking to quickly and efficiently modernize to IP. The Internet of Things is being adopted by organizations all around the world, of all sizes, and in all industries. In healthcare, upgrading to IP telephony often results in extremely disruptive hospital renovations that negatively impact patient care. By applying Modern LAN principles, healthcare organizations are eliminating fundamental barriers to IP adoption. A University Medical Center located in the United States was looking to create an IP-based emergency phone network that would remain operational in the event of a network outage. However, renovations required to rip-and-replace the existing wiring infrastructure to support the new IP phones would be extremely disruptive to patient care. In any medical facility, areas under construction need to be closed and sealed off to prevent contamination from airborne pathogens. As renovations in different areas are finished, these containment zones are taken down and set back up at the next renovation area. This process is extremely time and cost intensive. Hospital renovations also decrease the amount of space for patient care, as any area under construction is not accessible. Foot traffic also needs to be re-routed around the renovation areas, and the alternative routes are often inefficient and frustrating for staff, patients, and visitors. To complicate the project even further, the University Medical Center operates in a building over 100 years old. To maintain the building’s historical integrity, the renovation process would be more complicated, take longer and create even more mess and disruption. Using Modern LAN principles, the medical center established an upgrade plan that would prevent the extremely disruptive and time intensive renovation process. The medical center discovered that by using the PoLRE® switch, they could avoid the entire renovation headache. 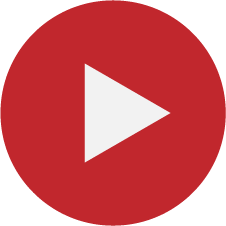 Modern LAN principles state that network design should be approached from an outside-in perspective. By first evaluating the needs of the endpoints, it was determined that by using new long reach switch innovations, the customer could leverage the existing CAT3 infrastructure to provide the exact power and bandwidth requirements up to 1,200ft (365m). By leveraging Modern LAN principles, the University Medical Center significantly reduced the project’s impact on the environment. The hospital was able to reuse 100% of their existing cabling infrastructure, which prevented approximately 240,000 feet of cable from ending up in a landfill (equivalent to the weight of 14 hospital beds!). The long reach capabilities of the new switches also eliminated the need to upgrade or install new IDF closets, further reducing material and energy consumption. IoTG (Internet of Things to the Power of Green) awarded the University Medical Center with a 4-star project rating for an environmentally responsible modernization to IP.